It’s easy to miss things in Arlington National Cemetery. Most people want to see the changing of the guard and the eternal flame of John F. Kennedy’s grave. It’s already a long walk so they don’t see much else. Those are great things to see, but the more you wander Arlington’s grounds the more you can appreciate what a special place it is. And so I spent a day in February walking Arlington, looking for things I hadn’t seen or not for awhile when I came across this gorgeous large black marble stone in section 7A not far from the Tombs of the Unknown and just down the row from heavyweight champion Joe Louis. Charles W. Davis was a Congressional Medal of Honor winner for his heroics in the 1943 Battle of Mount Austin, the Galloping Horse and Sea Horse on the island of Guadalcanal. Davis volunteered to carry messages between companies under fire. Captain of the 27th Infantry Regiment, 25th Infantry division, he later led an attack. When his rifle jammed on its first shot, he took out his pistol and kept fighting. The daring move inspired others to follow in winning the battle. He was later awarded the Congressional Medal of Honor. Davis later served during the Korean and Vietnam wars and retired as a colonel. He died in 1991. His wife Joan died in 2013 while their son Pvt. John Broderick Davis died in 1984. 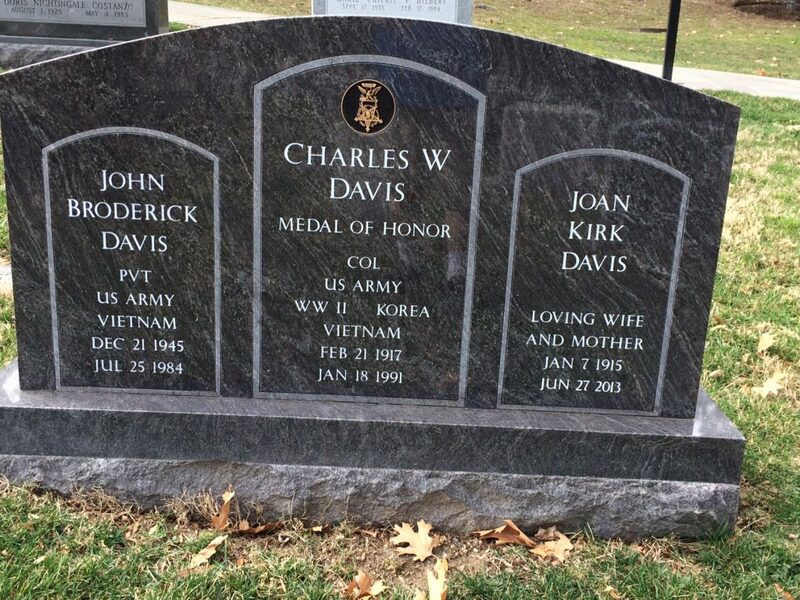 This entry was posted in Arlington National Cemetery and tagged Arlington National Cemetery, Best Arlington National Cemetery walking tours, Charles W. Davis, congressional medal of honor, Photo by Rick Snider. Bookmark the permalink.